"Exopto is Latin for "to long for" or "to desire greatly" and it is the dream of Frenchman Tom Puyaubert and his family to endeavor to craft and assemble wines where the whole adds up to more than the sum of their parts. Tom relocated from France to Rioja in 2000 after falling in love with the region and working for the French cooperage Saury as its Spain representative. Rioja is a wine region that is a "tale of two worlds". There is the one world most known today comprised of wineries founded in the late 1800's (e.g. Lopez de Heredia, La Rioja Alta) with a winemaking model taught to them by the Bordelaise who came to Rioja after phyloxera decimated Bordeaux. This model often referred to as the "traditionalist school" is based on blending varieties from all over the appellation and long aging in cask with multiple rackings or trasiegos. 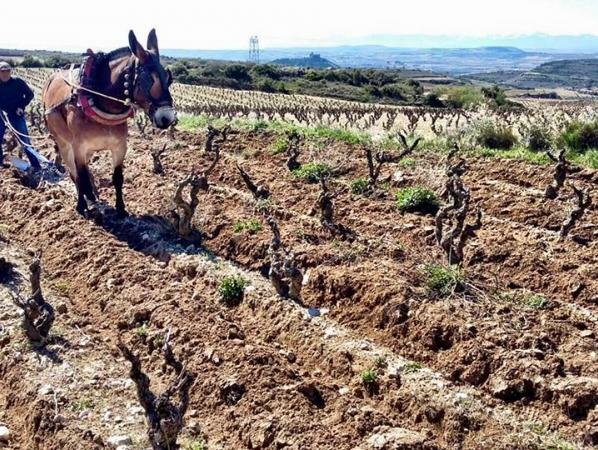 Before this time period, however, there was another model for wine in Rioja and that is of the "vigneron" or grape grower and winemaker – one that was a small family farm centered on a specific village and terroir. For this style, the winemaking was natural and not focused on long aging in wood. In this model, the vineyards were often located in terroir, or soil-specific, areas suited to specific varietals and sometimes too extreme for other grapes or crops. When Tom began Exopto, he wanted to do a project that produced wines within this historical context of Rioja - combining both worlds in a unique way. His idea is to remain true to the blending of the principle grape varieties and to do so from the best terroirs/villages for those varieties crossing sub-regions of Rioja. Each wine though, has a majority of a different principle grape – showcasing that variety specifically within the context of a blend. The viticulture and winemaking model is that of the "vigneron" days – small plots of vines in the extremes, wild yeast fermentation in concrete or old oak vats and then aging in a way to showcase the fruit, minerality and terroir not the wood or aged flavors that people often associate with Rioja. The Garnacha focused wine is called Bozeto de Exopto which translated from Latin means "sketch" or "draft". As the name implies, it is their "beginning" wine. The blend is largely Garnacha (Yerga-Agudo) with Tempranillo (Abalos) and some Graciano (Yerga) all of which are naturally fermented and then aged for 6 months in concrete and 5,000L oak vats for 6 months before being bottled. The hallmark of these wines are their elegance, freshness and gentle concentration of fruit. The use of the blending concept showcasing one variety for each wine truly brings both of Rioja's worlds together and for sure adds up to more than the simple sum of the parts." James Suckling 94"Offers some riper fruits, in the prune and plum-paste zone, with a hint of black tea and some tarry flourishes. The palate has cool, sleek flavors of dark-fruit and licorice, supple tannins and a long, smooth finish. Seamless." James Suckling 90"The full, plum-cake nose and the supple and slightly sweet palate make this easy to drink, but there is some structure behind all that and the finish is well balanced and quite long." James Suckling 93"Sweet black fruit and fine vanilla from the oak. Surprisingly plush for this category in spite of the serious tannins. Long and quite polished finish. Drinking well now."